On the main road between Claremorris and Tuam stands a large maroon and white building, Teach Uí Shioradáin, the first pub in Galway when you leave Mayo on the N17. North Galway is footballing country where local rivalry with Mayo is high. Few people know this as acutely as Cathal Sheridan, Teach Uí Shioradáin’s current licensee who is also a former captain of the Milltown team. According to Cathal, the pub has been in his family for six generations. Nothing is known about his great-great-great-grandfather who, according to the family, ran the pub as a shebeen in the early 19th century. Efforts to learn, more about him have been thwarted, not just because the national and county records were destroyed during the War of Independence and the Civil War, but a fire in the local church at the turn of the century also led to parish records being destroyed. Little is known about the next proprietor also, except that he was named James Slattery, and that his daughter Mary married Anthony Sheridan, a local national school teacher, in 1895. Mary Sheridan is listed as licensee in the 1901 census, partly because, as a teacher, Anthony Sheridan, was barred from running or owning a licensed bar. The 1901 census records Milltown as a village of 13 houses, two of which were pubs. Today, Teach Uí Shioradáin is the only pub in a village of 30 houses or so. The pub and family house were contained in a single-storey thatched cottage until 1920, when it was replaced by a new two-storey building which, through expanded, is in use today with the Sheridan family living above the pub. Following Mary’s death in 1936, the pub passed to her son Charlie Sheridan who ran it until 1970 when it was passed to his son J.J. (James Joseph). 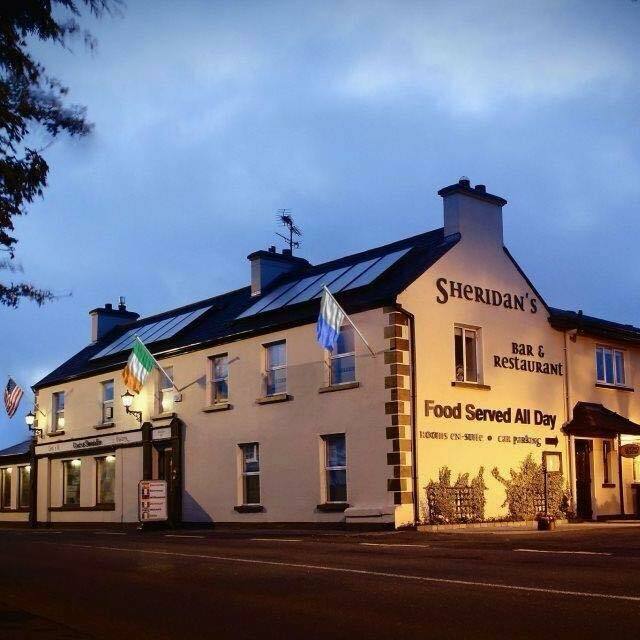 It was J.J. who gave the pub its current name, Teach Uí Shioradáin, which, in English means “Sheridan’s House”. Since 1995, the pub has been run by Cathal Sheridan. Inside, it has all the accessories of a modern pub: pool table, jukebox, gaming machines, dart board, Sky Sports television and even Internet access. A large function room has been added to the building, making Teach Uí Shioradáin a centre of community life today. I am connected by marriage to the Slattery/Sheridans. Would be interested in making contact with the pub owner to share aspects of my family history.